Since its inception, catering has joined the list of the most sought-after industries. Clients seeking catering services have varied expectations and tastes, which are increasingly becoming more sophisticated with time, and their demand for modern and more healthy eating is on an upward trend. To meet this ever increasing demand and live up to the customer expectations, caterers have come up with different types of catering services, some of which are event-specific. And yes, the success of any business depends on the level of customer satisfaction, and catering is no different. Catering types include wedding catering, social event catering, corporate catering, concession catering, and office catering. In this article, we focus on the first two. As the name suggests, wedding catering is a type of catering service provided at a wedding ceremony. Once all the wedding formalities have been finalised, reception becomes the next big thing, and here is where catering comes handy. 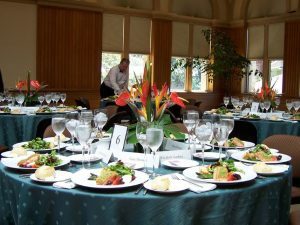 Wedding reception catering ideas vary with the nature of reception. Catering for smaller wedding receptions can appropriately involve serving finger food buffets accompanied with casual drinks. If you’re operating on a shoestring budget, this catering can also be your ideal choice. For a traditional wedding, canapés and welcome drinks can be on the menu. These can be followed by a sit-down meal. A lighter buffet later in the evening can be a great service to send guests home. Catering for a cocktail party reception may entail serving guests with champagne, followed by canapés. This should not be a self-service: servers should be in action. This is a type of catering offered at any social event, including a birthday party, anniversary party, farewell party, and retirement party. A wide range of foods, drinks, custom-made cakes, decorations, entertainments, bartenders, and appetisers are a few things that may be catered at such events.